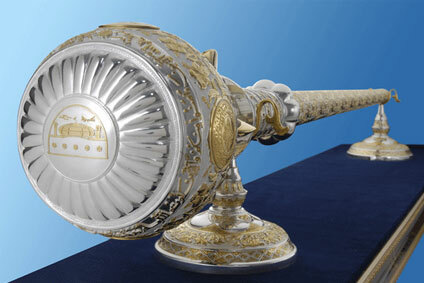 The mace was presented to USIM by the Honourable Minister of Education on behalf of the Government as a symbol of the power of the University. It is used on official occasions such as the Convocation Ceremony and the Installation of the Chancellor Ceremony. The five divisions with special symbols illustrate meaningful concepts. The University logo and the logo of the Government of Malaysia identify USIM as one of the public institutions of higher learning that safeguard the unity and integrity of the nation. The Gold Dinar, with both its front and back displayed, symbolizes the University’s aspiration to revitalize Islamic civilization, primarily through robust economic growth. The Dome, exhibiting futuristic elements of science and technology, symbolizes the intention of the University to promote the enlightenment of traditional Islamic knowledge, along with science and technology. Islamic designs demonstrate the efforts of the University to highlight the aesthetic value of the Islamic arts. Fourteen conjoined pieces with emblems of the fourteen states of Malaysia illustrate the firm support of all states for the University’s mission and vision in promoting contemporary Islamic education. Quranic inscription consisting of the University’s motto “Knowledgeable, Disciplined and Devout” and verses from Al-Baqarah 2:282, Al-Wujadalah 58:11 and Az-Zumar 39:9 that call for courage in seeking knowledge, upholding Islam, practicing self-discipline and always submitting to Allah. Geometrical designs of 12 lines that meet at one point identify USIM as the 12th public institution of higher learning, established by the Government of Malaysia. Designs with vivid Islamic characteristics and artistic motifs signify the firm integration of the faculty and general administration of the University and the dynamism of the academic programmes in the University’s quest toward making the vision, mission and objectives of the University a reality.